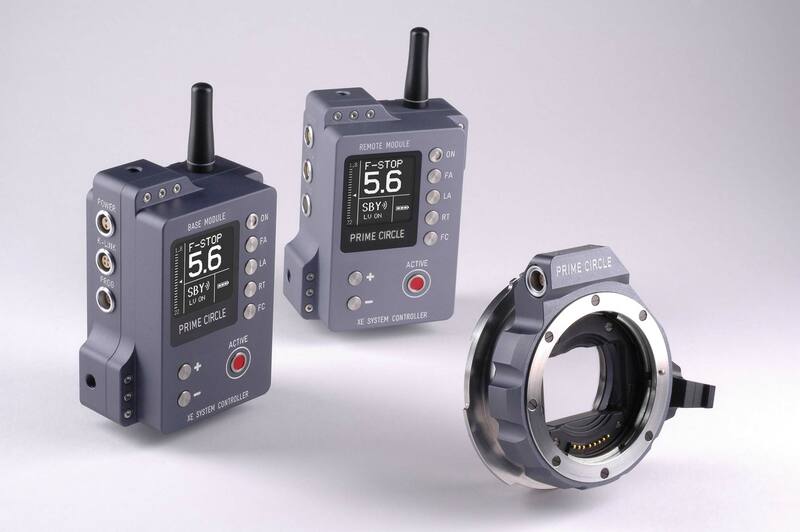 Dante Cecchin is a DP and inventor — and he was at P+S Technik’s IBC booth with the latest amazing updates to his Prime Circle Canon EF lens mount adapters, remote iris controls, and more. The adapter attaches to PL cameras (ARRI Alexa. Sony F65, RED Epic) and Sony FZ cameras (F5, F55) and the IMS System (interchangeable mount system from P+S Technik). Other mounts are coming. There are two big deal things about this mount adapter: Dante replaces the traditional Canon EF “twist-the-lens-to-lock” mount with his own traditional cinema style lens lock– like PL, PV and Mitchell mounts. You don’t twist to lock–you rotate the lens locking ring like you always did: “clock to lock.” It’s solid and sure. The other major thing is his electronic aperture control. Most EF mount lenses don’t have an aperture ring, so you can set it with the Prime Circle unit. You can do it directly or with wireless transmitter and receiver units. Dante also re-houses ZEISS XE still lenses into Cinema Style barrels. More on those in a future article. Mount PRIME CIRCLE XE and EF Lenses on high-end digital cameras. Remote Module for wireless operations up to 150 meters. Mirrored communication between Base Module and Remote Module. Can be ordered now, delivery expected first week of November.